On Friday my boyfriend sent me a link to a very interesting article in the Huffington Post titled “Roundup: Birth Defects Caused by World’s Top-Selling Weedkiller, Scientists Say.” If you have the time, I strongly encourage you to read the entire article. For those of you who are time-crunched, however, I will review some of the highlights below. If you’re sitting there saying to yourself “I don’t use Roundup, so I have nothing to worry about” you had better think again. We are all being exposed to Roundup, generally in ways we aren’t even aware of. As I have previously discussed in my blog posts King Corn and Soy: Health Food or Health Hazard, about 90% of the corn and soy grown in this country comes from genetically modified seed that is “Roundup ready.” What this means is that the farmer can spray the entire corn or soy crop with Roundup and it will only kill the weeds ~ the corn and soy have been genetically modified to resist the effects of Roundup. What this means for all of us is that most of the corn and soy grown in this country is generously sprayed with Roundup, and as previously discussed in the above posts, corn and soy are not only used as the major food source for much of our meat, poultry and farm-raised fish, but corn and soy products find their way into many, many of the products on today’s supermarket shelves. So unless you eat entirely organic, grass/pastured beef and poultry, wild-caught fish and no processed foods…you are probably being exposed to Roundup. Now I would venture to say that anyone reading this post is probably not really keen on herbicides like Roundup being present in the food they eat. Many of us probably rely on our government to protect us from harmful growing practices. 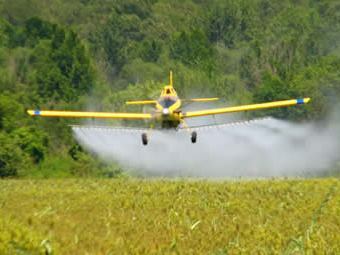 And in the US, the EPA does routinely reevaluate the safety of herbicides like the gylphosate in products like Roundup. In fact, glyphosate is currently under review by the EPA, a review which was opened in 2009 and which is set to conclude in…2015. Yes, 6 years to review the safety of a product that is used in agriculture to the tune of 180+ millions pounds a year. And worse yet, the EPA does not actually conduct any tests of its own, but instead relies on outside data, much of which comes from the agricultural chemicals business itself. Agribusiness giants, including Monsanto, Dow Chemical, Syngenta and BASF, will, as part of a 19-member task force, generate much of the data the EPA is seeking. So why all the recent fuss? 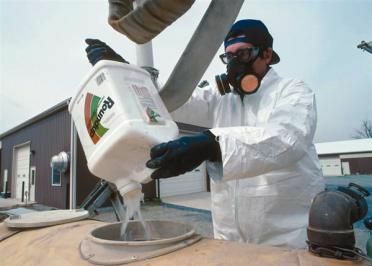 Roundup has been used since it was first introduced in 1972, and Roundup ready genetically modified seeds have been used since introduced in the 1990’s. The fuss is due to a report, just released by a group called Earth Open Source, a non-profit group that worked with scientists and researchers to perform a comprehensive review of data from existing studies regarding the safety of glyphosate. Their conclusions were that regulators have known for years that glyphosate causes birth defects in animals, yet they chose to ignore the data. One laboratory study done in France in 2003 found that Roundup and glyphosate caused the death of human placental cells. Another study, conducted in 2009, found that Roundup caused total cell death in human umbilical, embryonic and placental cells within 24 hours. Yet researchers have conducted few follow-up studies. …if you look at the line of converging evidence, it points to a serious problem. And if you look at the animal feeding studies with genetically modified Roundup ready crops, there’s a consistent theme of reproductive disorders, which we don’t know the cause for because follow-up studies have not been done. In Argentina, half of the country’s cultivated land is planted with genetically modified soy. The Argentine government was able to pull itself out of recession in the 1990s in part by promoting genetically modified soy. In 2009 an Argentine government scientist, Andres Carrasco did a study on glyphosate. This study…found that glyphosate causes malformations in frog and chicken embryos at doses far lower than those used in agricultural spraying. It also found the malformations caused in frog and chicken embryos by Roundup and its active ingredient glyphosate were similar to human birth defects found in genetically modified soy-producing regions. The report…showed that from 2000 to 2009, following the expansion of genetically modified soy and rice crops in the region, the childhood cancer rate tripled in La Leonesa and the rate of birth defects increased nearly fourfold over the entire province. So…what can you do to protect yourself from Roundup? The single most important thing you can do is to educate yourself about the food you eat. Buy organic as much as possible…organic products are not genetically modified. Pay attention to what you eat eats (yes, that does make sense, read it again if you have to)…in other words if you eat beef, pay attention to what the beef eats. Grass-fed is safer for a whole host of reasons, one of them being that grass is not genetically modified like the corn being fed to a majority of the cattle in this country. Pay attention to your dairy. If your dairy is coming from cows fed with GM corn, you can guarantee that will come through in the milk, butter, etc. What are the chickens you eat being fed? That also impacts their eggs. Don’t get overwhelmed, just get educated and make the best food choices you can…I will have more on this topic on Wednesday. This entry was posted in Nutrition and tagged Birth defects, EPA, genetically modified seeds, glyphosate, Monsanto, roundup. Bookmark the permalink. Great article!! I did have to read the “eat eats” a few times. I will definitely think more about this.